Obrajes (roughly, workshops) were key enterprises in the developing economies of Spain’s American colonies, principally as sites where wool, cotton, and other fibers were carded, spun, and woven into textiles. 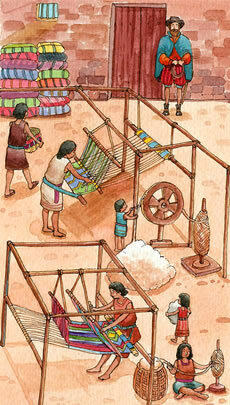 While indigenous peoples had woven cloth for millennia, the obraje was an exclusively Spanish imposition. From modest beginnings in the 1530s, obrajes developed over time into quasi-industrial enterprises, some with several hundred laborers, mostly Indian, under their roofs. Working conditions were typically harsh, with long hours, poor ventilation, frequent physical abuse, and low or nonexistent pay (Indian labor and tribute were required under encomienda and related institutions). Most obrajes were thus more akin to penal sweatshops than to workshops, as conventionally understood. The earliest known descriptions of obrajes date to the late 1530s in New Spain (Mexico). By the early 1600s, from 98 to 130 obrajes were scattered across central New Spain, clustering around the urban centers of Puebla, Mexico City, Texcoco, and Tlaxcala. By 1600, most obrajes averaged around 50 laborers, making the total number of workers engaged in obraje production in New Spain around 6,000, though there was a spectrum from large to small; the latter were often called trapiches. Scholars have traced the origins of private or non-state-mediated Spanish-Indian labor relations (i.e., non-encomienda, non-repartimiento) to such early colonial period obrajes—labor frequently supplemented by prisoners and convicted criminals. Philips’s companion, Job Hortop, described his experiences carding wool in Texcoco’s obrajes “among the Indian slaves.” Their descriptions of “Indian slaves” corresponded with Spanish custom and law, in which obraje laborers were frequently called slaves. The development of obrajes was encouraged by both the Crown and the highest levels of colonial government, with authorities such as New Spain’s first viceroy, Antonio de Mendoza, actively promoting sheep herding, wool production, and manufacture of cheap cloth within the colonies. By the late 1600s, obrajes had become an important pillar of the colonial economy in New Spain and elsewhere, generating textiles and other goods mainly for internal consumption. In the 17th and 18th centuries, opposition to royal support for obrajes by Spain’s textile manufacturers mounted, though it remained insufficient to retard the growth of colonial production and exchange. Similar developments unfolded in colonial Peru. As in New Spain, obrajes emerged in the decades after the conquest with official encouragement and support, especially around Quito, which by the early 17th century had become South America’s leading textile manufacturer. Quiteño cloth, prized for its high quality, was produced by both indigenous “community obrajes” that employed ancient techniques for carding, spinning, and weaving wool (some housing upward of 200 full-time workers) and smaller, privately owned obrajes similar to those in New Spain. Overall, obrajes illuminate key aspects of colonial Latin American history, including land and labor relations, the intersections of Spanish and Indian worlds, and the role of the state in promoting specific types of production and exchange within the colonies.